"We're here because we’re here" saw Anathema move even further away from their roots, but with "Weather Systems" they've totally turned their backs on their doom roots. "Weather Systems" takes us on an introvert journey; an emotional, atmospheric and dramatic trip that demands a lot of the listener. This is a very intense musical experience, perfectly captured by producer Christer-André Cederberg, who has also taken care of the mix. Words like beautiful, heartfelt and expressive come often to mind when I listen to this magnificent album. 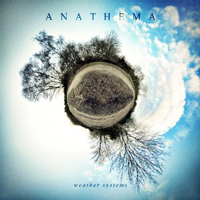 The very warm and organic sound is miles away from the sound of old ages, and I am sure many old fans will have some problems with the new direction Anathema has taken with this album. To me it's simply the logic step to take after "We're here because we’re here", and it shows a mature and genuine rock band that's not afraid to move forward leaving the past behind. Metal it ain't, that's for sure, but I do not mind because this is a homogeneous, adventurous and innovative album that should attract fan all over the rock specter. Each song is a small gem and I love it from start to finish - a brilliant piece of art!